Green Acres Place is one Bossier City’s most iconic neighborhoods. It is known as one the safest, most well kept communities among locals, and it lives up to this reputation day after day. The homes here were built in the 80’s, 90’s and early 2000’s, mostly brick two story homes in the craftsman and neo-eclectic styles. The appeal of living in this neighborhood, besides the beautiful homes, is its convenient location. For commuters and those who need to get across the city fast, I-220 is only a couple minutes from both the front and back entrances. You see, Green Acres Place spans the distance between Airline Dr. and Benton Rd., meaning access to the areas best shopping, schools and hospitals. Those who enjoy the outdoors will also fine this neighborhood very convenient, as it is only a few minutes drive to Cypress Black Bayou, the Red River, and Lake Bisteneau. I-220 also supplies a quick route to downtown Shreveport, I-20, Cross Lake, and the regional airport. 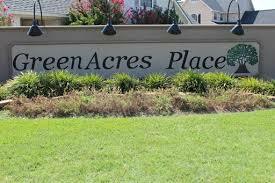 If you are looking for homes in North Bossier, do not miss Green Acres Place. It’s beauty, safety, and comfort gives it an appeal few other neighborhoods can match.